Five months after being appointed chief administration officer of the Potala Palace in Tibet, Qungda still feels the heavy weight of responsibility. "It is such a grand duty," said Qungda, who replaced the previous chief officer Champa Kelsang after the latter retired due to old age last December. 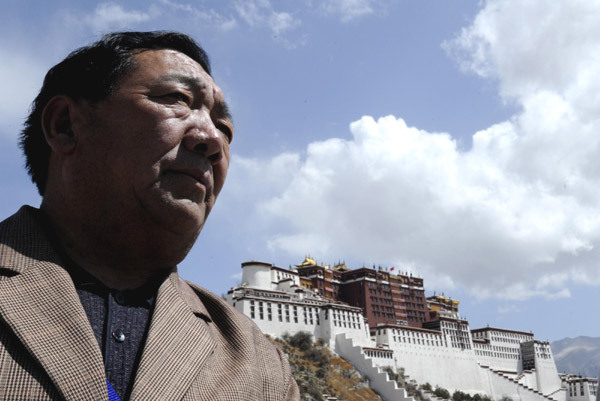 "The palace, a construction miracle, is not only a treasure of our Tibetan people but the whole world," he said. Qungda, 60, well understands the fragility of this ancient stone-and-wooden structure, built in the 7th century. From 1965 to 1985, Qungda served in the fire control department of Lhasa and fought a serious fire in one of the chapels of the palace in 1984, the fourth fire in the palace's history. Firemen, monks and civilians in the neighborhood put out the fire within three hours, stopping it from spreading to the rest of the building. The blaze destroyed half of a valuable Buddhist sutra manuscript. It took five years to restore the chapel. "The day after the accident, a team of 10 firemen were posted inside the palace and I was appointed the leader," Qungda said. The first thing he did after working in the Potala Palace was explore every corner of the labyrinth palace, so to get a full picture of its layout and risks. The Potala Palace has had no fire since. In 1985, Qungda left the fire control department to work in the palace's security department. In 1988 he was appointed vice chief of the palace's administration and remained in the role till his recent promotion. Born into a farmer's family in Lhasa, Qungda had been attracted by the Potala Palace since he was a child. "It looked very solemn and sacred from outside and I was always wondering what it would be like inside," he said. The Potala Palace remained the residence of the Dalai Lamas till 1959. In 1975, Qungda first entered the Potala Palace as a fireman taking part in a fire control exercise. "It never occurred to me that I would work inside it for more than 20 years," he said. During these years, Qungda witnessed two large-scale restorations of palace's interior, in 1989 and 2002 respectively. The latest restoration ended in 2009. "It made me feel a little bit relaxed as the latest restoration eliminated most of the risks in the framework and facilities," he said. In 2003, the palace administration limited the number of visitors to 2,300 per day, which has helped protect the grand old structure. However, Qungda remains cautious. No matter how cold it gets, staff are not allowed to use electric heaters as they are a safety risk, he said. His son Norsang Nyandrak is following in his father's footsteps, working as a fireman inside the palace. "I am glad he understands the importance of his work and enjoys it," Qungda said. Qungda always said he would devote the rest of his life protecting the Potala Palace.